Recumbent bikes are one of the most influential fitness machines that are currently circulating in the market. They are popular because of their portability, ease of use, and because they provide ample toning of leg, calf and ankle muscles all in the comfort of your own home. Recumbent bikes are excellent if you want to exercise and develop better physical strength. They may resemble bikes but the pedals are positioned a little below the seat which means that your legs will be extended in forward direction instead of under the seat which eases uncomfortable strain on your joints, ankles, and especially the back. 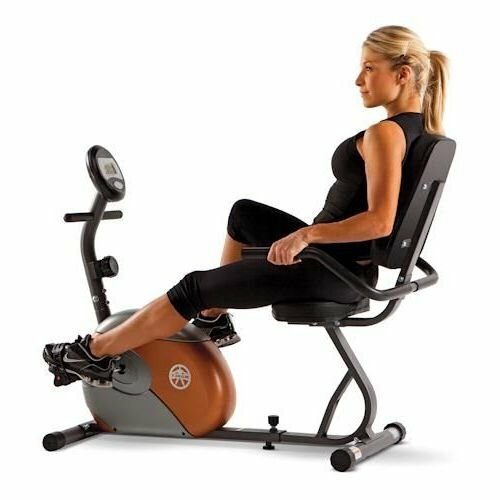 The Marcy ME 709 Recumbent Bike has been one of the more endearing popular exercise bikes in the fitness machines industry. With an affordable price range, and a decent array of features, it has both impressed and satisfied consumers alike. In this review, we will take a look at what this machine has to offer. 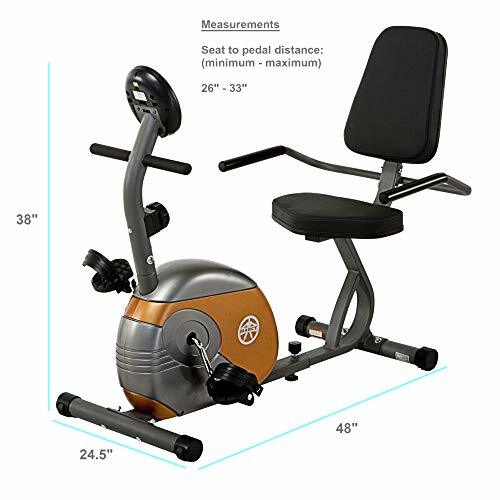 The Marcy ME 709 Recumbent Exercise bike measures at dimensions of 55” x 25” x 40”. The bike itself weighs a mere 66 pounds and has the capacity to support up to 300 pounds of weight. Although customer reviews have claimed that people who weigh more than the maximum weight threshold have also been able to use the bike. The model itself is a solid steel construction with 2 inch steel tubing that provides the necessary sturdiness as you exercise. Because the bike does not have levelers, you will need to make sure it is placed on a level surface in order to avoid potential wobbling when you’re working out. The bike is easy to adjust and portable, as built in wheels found at its base allows you to transport the bike from one room to the next without having to much worry about saving room space.It comes in three different color codes, namely black, gray, and copper. The ME 709 is a well-rounded bike that gives you a number of useful features for its nominal price tag. It offers 8 different resistance levels that will both increase or decrease the intensity of your workout by a mere turning of the knob. You will just have to adjust the knob in order to create more magnetic resistance which in turn will amplify the level for which you will have to exert your legs. The resistance also provides a fluid, smooth, and noiseless operation when running. A fully functional, oversized LCD screen helps you keep track of your exercise readings by monitoring total speed, distance covered, elapsed time, and total number of calories burned. No track progress of your workout is going to get missed with these readings displayed in front of you. Apart from that, the Marcy ME 709 Recumbent Bike has a seat that is firmly padded and an ergonomic angle for the back ensures your workout will be a comfortable one. It also allows you to adjust the seat (which is distance from seat to pedal) in horizontal direction (it can be moved both forward and back). A knob found on the base of the frame that connects the seat to the rest of the bike can be turned loose which in turn will help you adjust the seat. This helps accommodate users of varying heights. Counterbalanced pedals are weighted and designed to provide foot support and maximum control as you pedal them in both forward and backward direction. The handlebars themselves can also be adjusted to match your level and the foot straps can be modified in order to fit your feet and provide extra comfort. So with all this in mind, let us weigh the pros and cons of this machine. checkAffordable and provides reliable features for a small price tag. checkEight levels of resistances means both new and experienced users can draw something from the bike. Seasoned users can increase the resistance for much intense workouts. The Marcy ME 709 has been one of the best-selling recumbent bikes in recent years, and all of this is because of its affordability, adjustable components, and the decent magnetic resistances it features. Sure, the bike may not have a lot of flashy features but it is minimalistic and straightforward with what it offers. And by golly, what it offers is also very good. While it may lack preset workout programs, it still does a good job at catering to both newbies and seasoned veterans. By purchasing this machine, you will be investing in not only a quality recumbent bike but also something that is guaranteed to last you for a long time in the future. This recumbent bike is a bestseller for good reasons; both comfort and reliability.